Having a pool at your home can provide the entire family with a way to cool off in hot weather. Pools can also be a fun opportunity for exercise as swimming is actually a great workout. One of the most difficult aspects of pool ownership is the cleaning process. Cleaning and maintaining a pool can be expensive and time-consuming. To keep your pool clean, it’s beneficial to invest in a good robotic vacuum cleaner. These cleaners can pick up dirt and debris from your pool so you have less manual labor involved in the pool maintenance process. 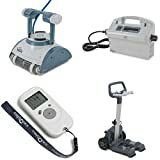 There are many types of robotic pool vacuums and they come in a wide range of prices. Some are designed to climb the walls to clean the entire pool while others may only be able to clean the bottom of the pool. It’s best to use your robotic vacuum frequently to reduce any types of built-up dirt and grime. This will help extend the life of your pool. Some robotic cleaners are specifically designed to be used for above ground pools or in-ground pools while others can be used on either. The following is a list of the top best robotic pool cleaner brands. The Dolphin Escape Robotic Above Ground Pool Cleaner has a large filter that is easy to change and designed to last through many cleanings. This pool cleaner weighs only 14 pounds and is able to thoroughly clean your pool quickly and efficiently. This pool cleaner has been designed to be used in above ground pools. It has an oversize debris cartridge that can hold around 60% more dirt and debris than other similar cleaners. The unit has dual scrubbing brushes that are able to remove difficult contaminants from your pool. This pool cleaner has and energy efficient 24 volt motor. The Dolphin Dynamic DX5S robotic pool cleaner has IntelliScan Technology that helps it analyze the surface of your pool so it knows where to clean. This helps increase its efficiency and prevents it from cleaning areas that don’t need it. It has a 2 hour, 3 hour, or 4 hour cleaning cycle. This robotic vacuum from Dolphin Dynamic comes with a caddy that helps you transport the cleaner from storage to your pool. The unit also comes with a remote that has touch controls so that you can easily control your vacuum. It has a full filter indicator that lets you know when to change the filter and the included dual mesh filters hold a lot of dirt and debris. The Aquabot S300 Prime Robotic pool cleaner is designed to clean the floors, coves, and partial walls of your pool. It is safe for use on all types of pool surfaces, including vinyl. This robotic vacuum has a long 50′ floating cable to allow it to reach the entire area of your pool. 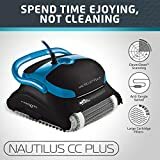 This robotic vacuum pool cleaner has filter cartridges that can capture the smallest pieces of dirt and debris to keep your pool clean and ready to use when you need it. The top loading filter is easy to get to when you need to change it. Plus, the clear polycarbonate lid allows you to see inside so that you know when your filter needs to be changed. The Polaris F9450 Sport Robotic pool cleaner was designed to be used for cleaning in-ground pools. This cleaner comes with an ultra-fine sand and silt filter canister. This works especially well for those who live in sandy areas as this helps to remove even the finest particles from the floor of your pool, leaving it sparkling clean anytime you want to take a swim. This pool cleaner from Polaris has Vortex Vacuum Technology so that it can quickly and efficiently clean your entire pool. It has a large filter canister with top access so you can easily change it as needed. The unit has 4 times the capacity of many other similar robotic pool cleaners. 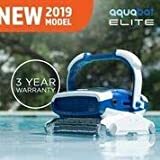 The Aquabot Pool Rover S2-40i Automatic Robotic pool cleaner can work for both above ground and in ground pools. This unit has a 40′ long cord and a configuration that allows it to clean pools of any shape up to 30′ long. It can navigate dished out bottoms and coves without problems. This robotic pool cleaner can complete the cleaning process in 1 hour, filtering up to 5000 gallons in that time. It comes with 3 filter bags, a rubber-coated thermoplastic Kevlar cord, and a 110v power supply. It’s equipped with rollers that have NeverStuck technology so it can go over raised areas in the pool without getting caught. 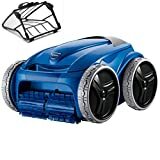 The Polaris F9550 Sport Robotic pool cleaner is designed for use with in-ground pools. 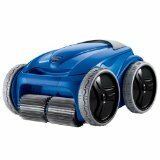 This robotic cleaner has 4-wheel drive technology so that it doesn’t miss any areas when cleaning your pool. It’s also equipped with Aqua-Trax tires that allow it to cover any type of pool surface safely and effectively. This robotic pool cleaner from Polaris has a rear water propulsion system that allows it to reach tight spaces like corners and under stairs. It comes with a 7-day programmable timer and a handheld remote for convenience. Also included with this vacuum is a caddy that allows you to move the unit from storage to your pool with ease. The Hayward SharkVac Robotic pool vacuum uses smart steering technology to cover the entire pool space efficiently in around 2 hours. It uses a cleaning pattern that is designed to reach all the spaces in the pool without leaving behind dirt and grime. This unit is easy to setup and requires no extra hoses, pumps, or other equipment. This robotic vacuum from Hayward has a top-access cartridge that is easy to remove. You can rinse it with your hose when it’s dirty for quick cleanup. The vacuum runs separately from the pool’s filter system which helps prevent filter backwash cycles, keeping your pool fresh, clean, and always ready for use. The Aquabot Elite Robotic Pool Cleaner has top-loading cartridges that are easy to change without a mess. It has a 360-degree swivel on the cord to prevent tangles while the vacuum is moving around your pool. The dual scrubbing brushes are able to remove algae and biofilm so that your pool looks clean and clear. 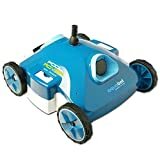 This robotic pool cleaner from Aquabot has a storage and transport caddy that helps you move the vacuum around as needed. It comes with a 3-year manufacturer’s warranty for peace of mind against any issues. The vacuum is equipped with a built-in variable timer that allows you to forget about the cleaning process as the unit does the cleaning on its own. 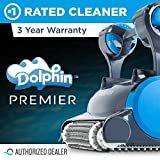 The 2017 Dolphin Premier in-ground pool cleaner comes with a 3-year warranty that offers rapid repair options in case anything goes wrong. 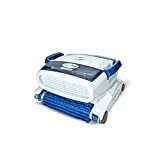 This vacuum has dual filter cartridges and an over-sized bag that means you don’t have to empty the unit as frequently as with some comparable models. This robotic pool vacuum has 360 swivel technology so that it never gets tangled with the cord. This unit is designed to be energy efficient and uses up to 87% less power than other pool cleaners. It has the ability to scan the pool surface to find the areas that need the most attention so that your pool is cleaned and ready for use. The Dolphin Nautilus Plus Cleaner has a patented swivel cable that is designed to prevent tangling while the unit is moving around your pool. This vacuum is able to scrub, vacuum, and filter all your pool surfaces. It can complete a full cleaning cycle in around 2.5 hours. This robotic vacuum cleaner from Dolphin has a weekly timer that allows you to set the unit to clean when it’s most convenient for you. This vacuum comes with a 2-year warranty from the manufacturer. It has an extra large filter that means you don’t have to empty it as often. Plus, the unit is designed to clean all surfaces in your pool, including the floor, walls, and waterline. Having a pool at your home can provide you with an excellent way to relax, as well as a convenient way to exercise at home. Plus, if you have children or grandchildren, a pool can occupy them during warm weather. But keeping up with pool cleaning and maintenance can be a hassle. If you invest in a good robotic vacuum cleaner, you don’t have to spend a lot of time manually cleaning your pool. This allows you to enjoy your pool rather than use up your free time with pool cleaning and maintenance. When choosing a robotic vacuum cleaner for your pool, you should be aware that some are designed for use with in-ground or above ground pools while others can be used for any style of pool. It can be helpful to read online consumer reviews on pool cleaners as these can provide you with information on how well the unit works. Pool vacuums can be pricey but most pool owners find that they are worth the investment as they allow you to enjoy your pool more since you don’t have to spend so much time cleaning it.